LaCreta Holland is a wife, mother of four, and grandmother. She also is passionate about cooking and teaching. She has been a substitute teacher for the State College Area School District and has taught cooking classes for a number of years through the SCASD Community Education program. 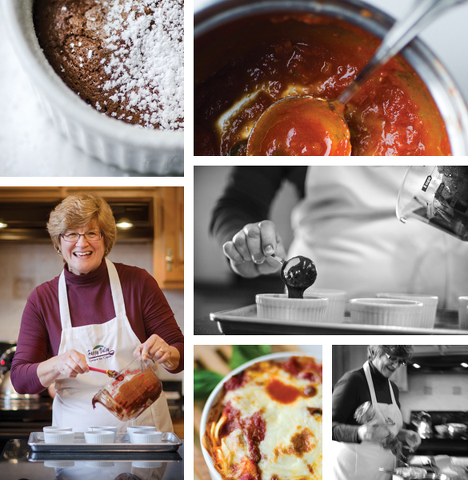 In January 2015, she started her business, Happy Valley Learn to Cook, which offers a one-on-one, hands-on, two-hour instructional cooking class held at Holland’s home in State College. Growing up in St. Louis, Missouri, she was influenced by her southern grandmother’s cooking. Her love for Mexican food started with her mother’s love for hot sauces. After college, Holland lived in Washington, DC, and was fascinated by all the international food offerings available there. After getting married and having four children, her family of six moved to Lerici, Italy. Her fascination for Italian cuisine and cooking seasonally inspired her to really develop her cooking skills. She took a few cooking classes in Italy, studied some cookbooks, and received some tips from people who were living in Italy. “A lot of cooking is trial and error. The more you practice, the more you learn and become confident, hence the more success you will have,” she explains. Cooking classes through Happy Valley Learn to Cook with Holland are $55 per person, and the price includes all the ingredients. Some of the popular classes are baking basics, cooking basics, bread baking, cake making, cooking with pasta, how to cook vegetables, pie making 101, soups and stews, Italian cooking, and make your own jam. Other topics include college staples, a course that teaches college students how to make food that doesn’t come from a box, such as homemade macaroni and cheese and homemade pizza. Grocery store tour is a course on how to save money and cut calories at the grocery store. This Valentine’s Day, you can take a course with Happy Valley Learn to Cook and make a simple yet elegant dinner for your sweetheart, or book a cooking class for two for a unique date idea. To make the sauce, place about 2 Tablespoons olive oil in a medium-sized saucepan and turn the heat on medium. Put the onion in the oil and saute 5 minutes for the onions to soften. Add the sliced garlic and stir. Add the can of tomatoes, the water and the red chilies. Let the sauce simmer on low for about 20 minutes. Take the pan off the heat and add the basil. While the sauce is cooking, preheat the oven to 400 degrees. Put a large pot of water on to boil. Cook the pasta according to the package directions. When the pasta is cooked, drain the boiling water and add the orecchiette to half the pasta sauce and one handful of Parmesan Cheese. Stir together. In a 8 x 11 inch baking dish (or the equivalent) grease the dish with some olive oil. Layer a little pasta in the pan, followed by some tomato sauce, a handful of Parmesan cheese and several slices of Mozzarella cheese. Repeat these layers until you've used up all the ingredients, ending with a good layer of cheese on top and a drizzle of olive oil. Bake the pasta about 30 minutes, until golden brown on the top and bubbling. Place a small amount of water in a saucepan. Place on the stove and turn the heat on to medium-low. Place the chocolate and butter in a bowl that can sit on top of the saucepan. Put it on top of the simmering water but don't let the bowl touch the water. Stir to help the chocolate and butter melt. While the chocolate mixture is melting, in medium bowl, whisk together the cornstarch and sugar. In another medium bowl, whisk together the eggs and egg yolks. Remove the chocolate mixture from the stove and whisk in the cornstarch mixture, then whisk in the egg mixture until well combined. Place the batter in the refrigerator until chilled, up to 3 days. Butter six 6-ounce ramekins and coat the insides with sugar, shaking out the excess. Divide chilled batter evenly between ramekins and place ramekins on a baking sheet. Bake the chocolate cakes about 12 to 15 minutes, just until the cakes are "set" (when you shake the baking sheet, the batter does not jiggle, but you can tell it is still soft). Dust the cakes with confectioners' sugar. Serve immediately!